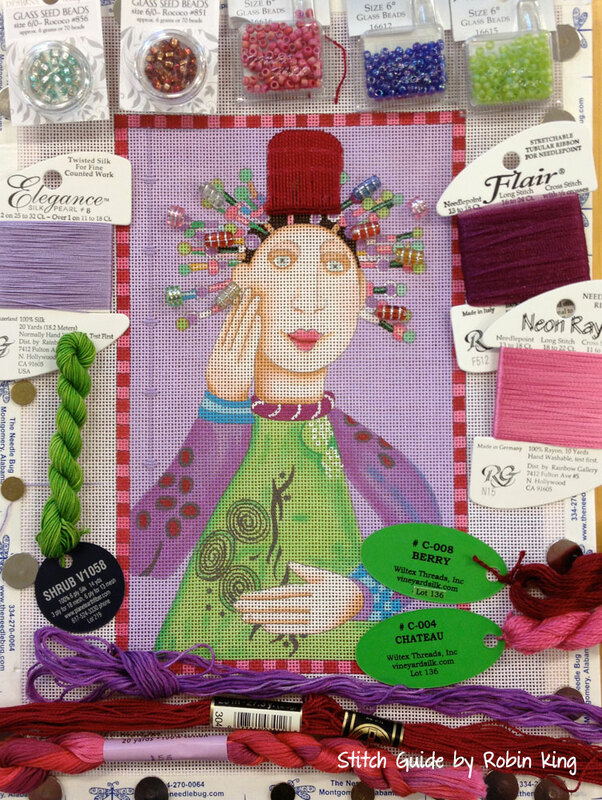 I am getting ready to head up north and teach this weekend at Peacock Alley Needlepoint in Ada, Michigan. 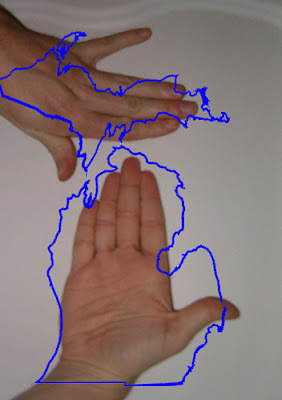 ... Or, one hand (my preferred version) for showing the Left Hand in the Mitten pose. 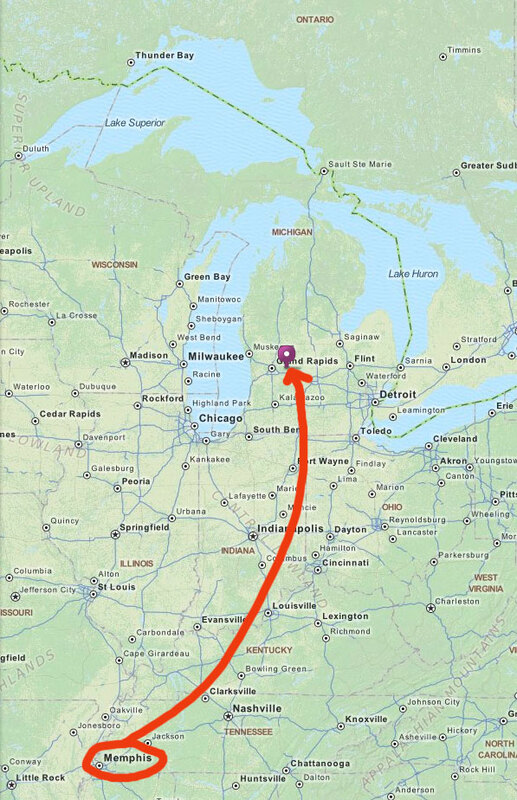 Either way, it is a fun way to show where you are from or where you are going. 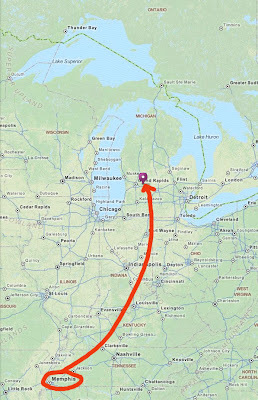 Ada, Michigan is just outside of Grand Rapids. I have never been there. I have been to Mackinac Island, MI on a family vacation as a kid. I still remember the Salt Water Taffy! (Mitten reference: Tip of Middle Finger.) My Eight Grade class took a field trip to Detroit in 1970. (Mitten reference: base of Thumb.) I remember fun family outings to Lake Michigan in the winter and seeing Lake Michigan frozen with ice buckles as tall as a house. 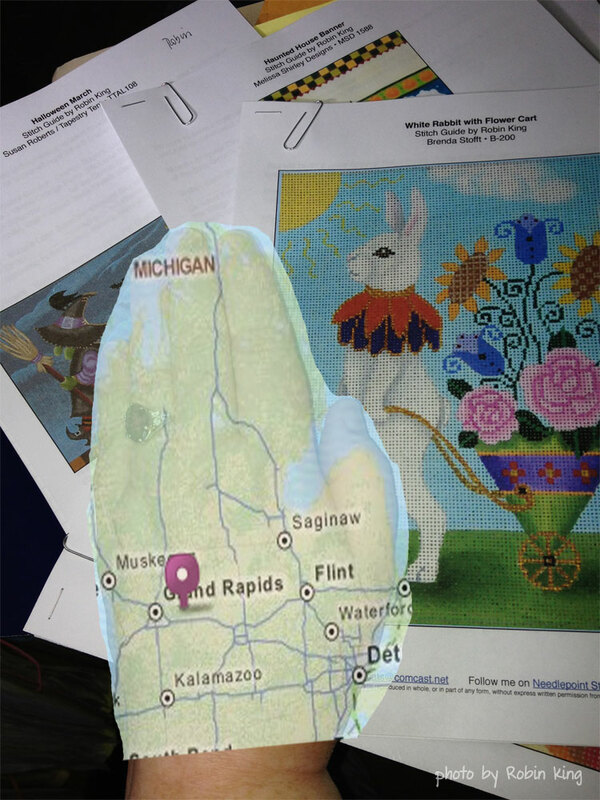 As a needlepoint teacher, this will be my first time to the great Mitten State. It will be fun seeing Sandy (Mama Peahen) and her customers called the Peababies. 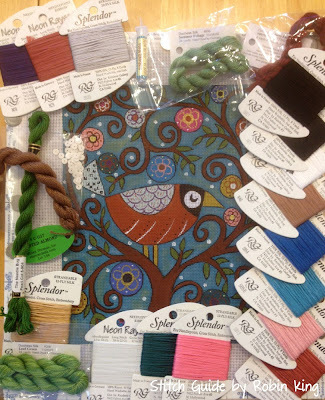 All this is reference to the name of the store, Peacock Alley Needlepoint. 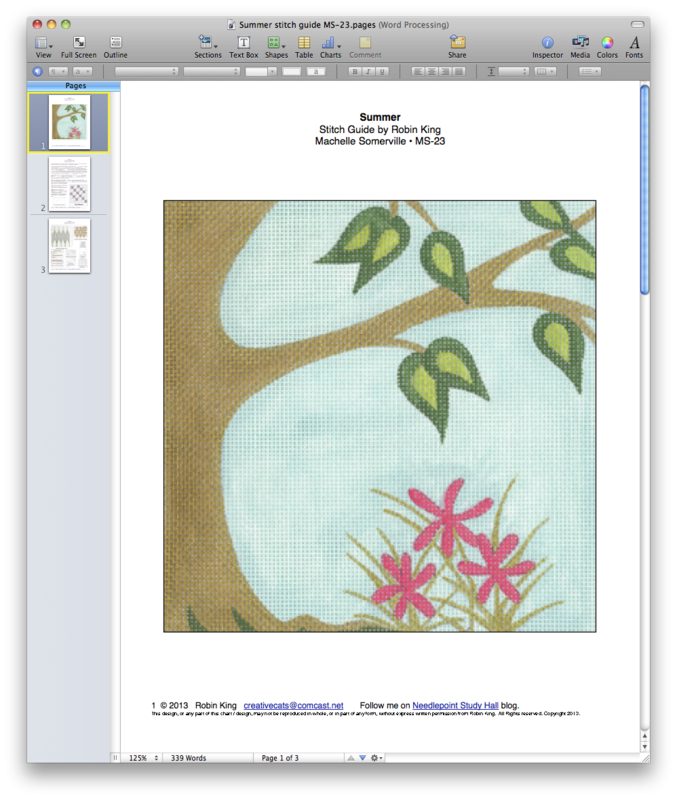 The two-day Canvas Enhancement classes are on Friday, August 2 and Saturday, August 3, 2013. We will have a meet and greet on Thursday night, too. I feel like I know many of these women from Facebook. 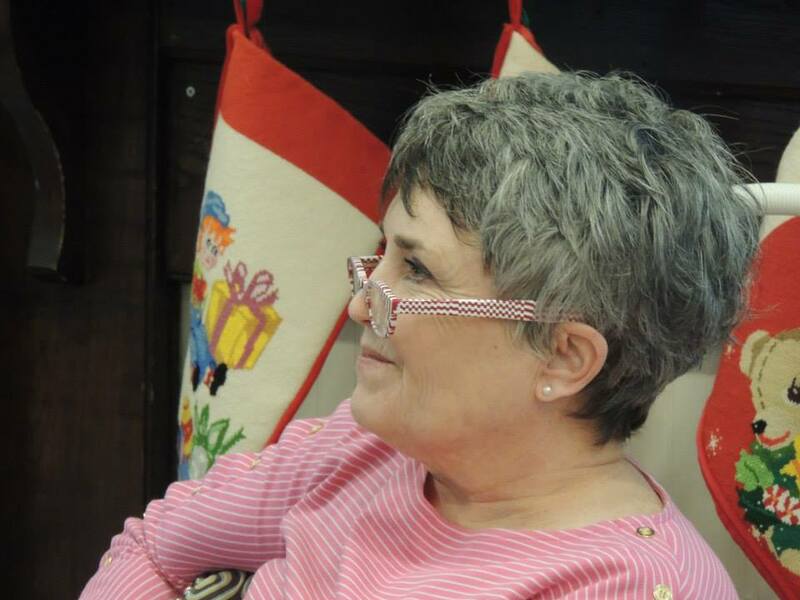 Sandy does an excellent job using Facebook to communicate with her customers. 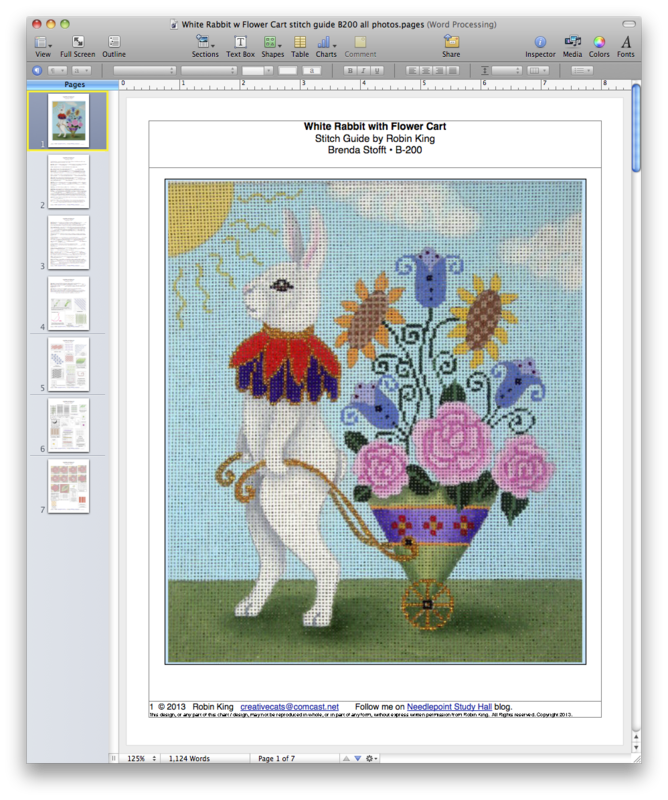 It will be fun meeting Machelle Somerville: a Michigan needlepoint designer (Machelle Somerville Designs) represented by Fleur de Paris and also works at Peacock Alley Needlepoint. My plan is to take photos of each person's canvas with selected threads and their works in progress. That's when the magic begins. Check out the Peacock Alley Facebook page, too for updates. Jules (the cat) loves an empty suitcase. She is a funny cat. 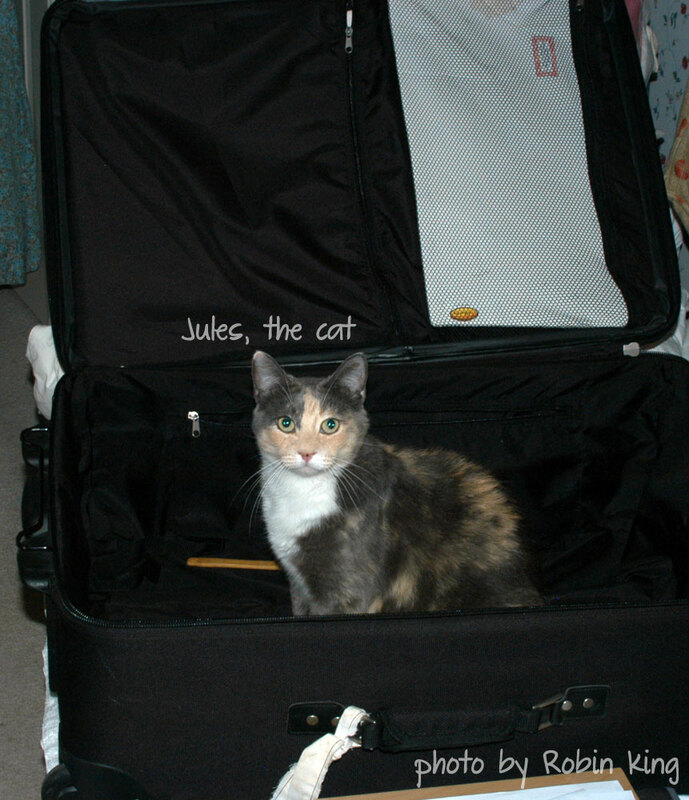 My suitcase is already for packing; Jules (the cat) is in charge until the actual loading begins. She is a funny cat. Finally (!) 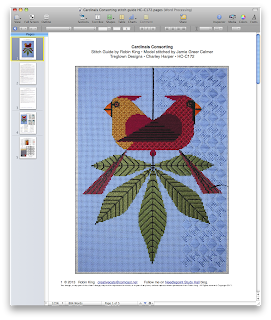 had the chance to update the list of the Stitch Guides I have written. 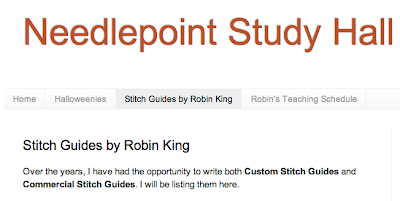 You can see them on the "Stitch Guides by Robin King" tab. Just look below the big words NEEDLEPOINT STUDY HALL and there are some tabs: Halloweenies, Stitch Guides by Robin King, and Robin's Teaching Schedule. 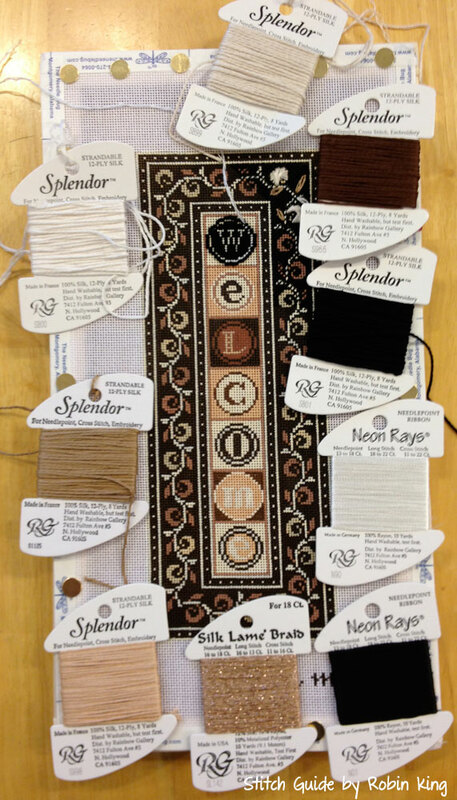 The list is long with a real nice assortment of designers represented. There are no pictures (yet!) 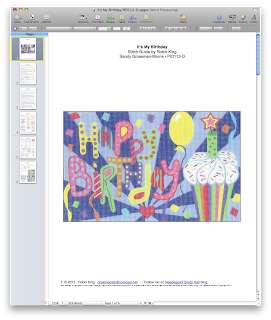 but the Designer Name, Canvas Name and Number are posted. 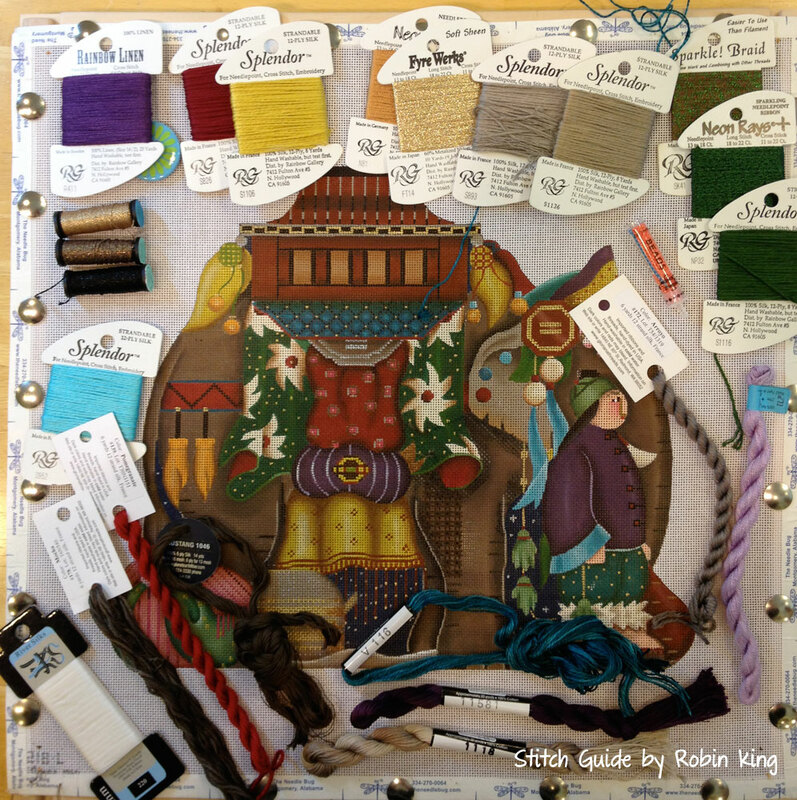 Chances are, if you already have a canvas, you can look at your stash and see if I've written a guide. If you are interested just let me know. You can email me at creativecats@comcast.net. Shop Owners can also contact me for Wholesale Inquiries. 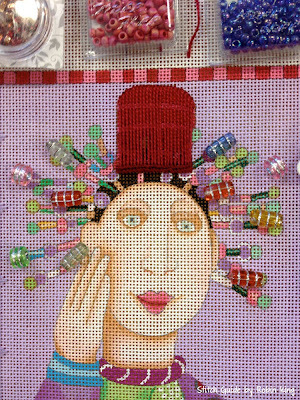 I'll be blogging again soon... about my upcoming trip to Peacock Alley Needlepoint in Ada, Michigan and my two-day Canvas Enhancement classes. Looking forward to it. Retailers and Shopping Networks have recently made a big deal about Christmas in July. Thought I would join in and play along. Did I ever tell you about the Jolly Nutcrackers? 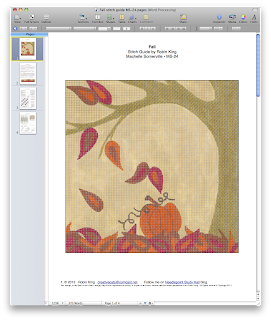 It is a wonderful canvas by dede Ogden (ED-4004P). It comes on 18 mesh, 14" x 14" square, and is great for a pillow or frame. 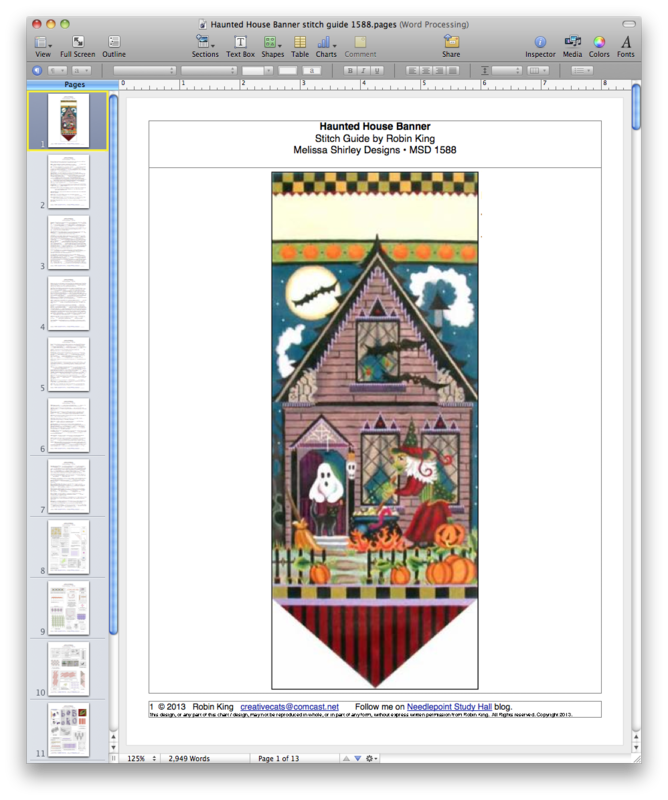 The same design also comes in a Large Stocking shape. Blog readers might already know two things about me: I love cats and I adore Nutcrackers. 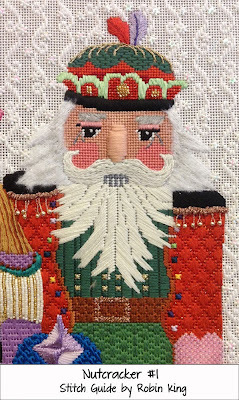 I have stitched a few Nutcrackers in my day. 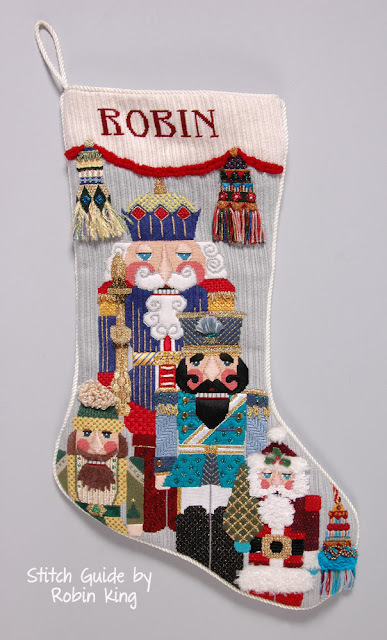 My own Christmas stocking has four Nutcrackers (or as I call them "The Brothers") by Shelly Tribbey (CS-17). 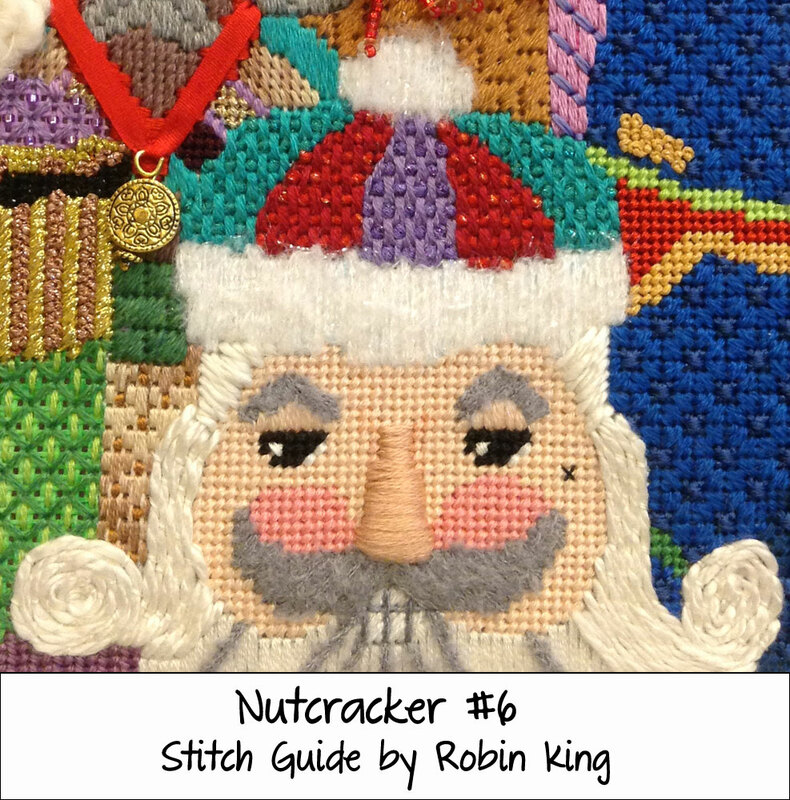 My very first Nutcrackers were stitched from stitch guides written by Meredith Willet (Herr Drosselmeyer) and Susan Portra (Mr. White Santa, Mrs White Santa, Victorian Red Santa). I worked with Amy on the Chimney Sweep during her canvas enhancement classes, and I did the Blue Nutcracker on my own. 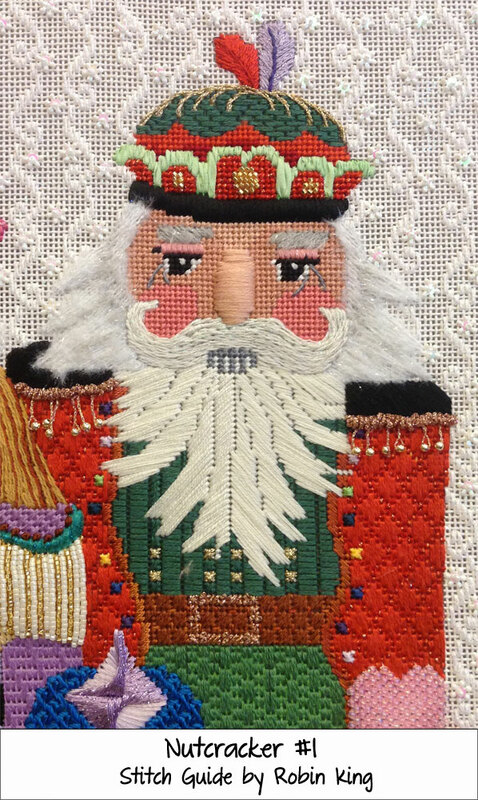 I also stitched this Nutcracker from Melissa Shirley; love the round Leather Box. 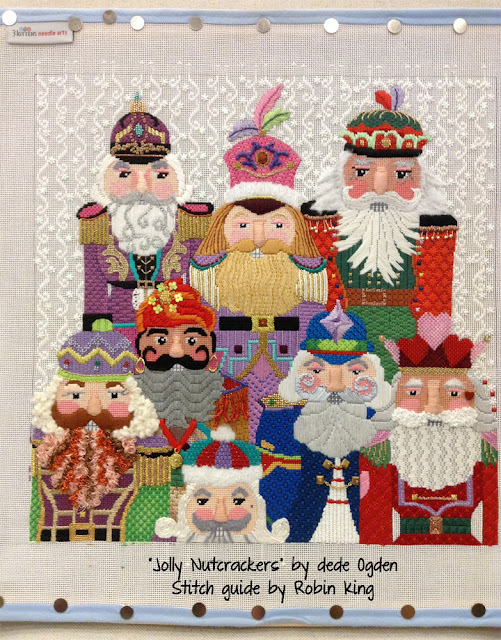 So when Julie Mast, owner of 3 Kittens Needle Arts in Mendota Heights, Minnesota, asked me if I would write the stitch guide for the Jolly Nutcrackers by dede Ogden, I agreed ... sight unseen. Her description was fetching enough. 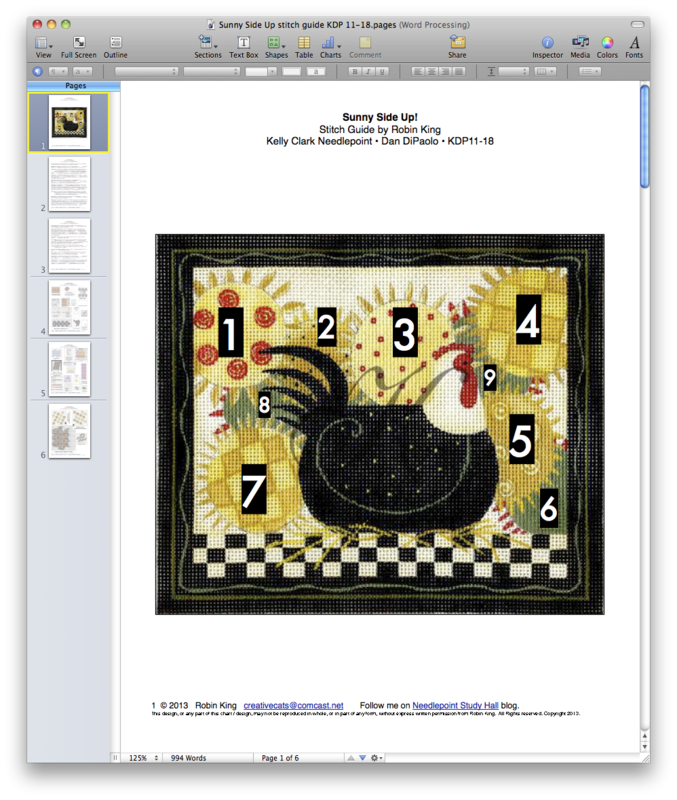 Julie sent me the canvas and we discussed over many phone calls and emails how she was wanting to present the Jolly Nutcrackers on a monthly basis to her interested customers who had signed up in groups for this journey. Month by month each guide was written, charted, and thread selections were made. 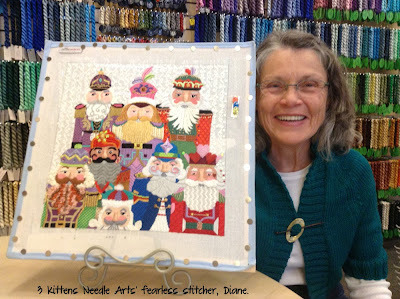 Diane had agreed to stitch the Jolly Nutcrackers model for 3 Kittens. 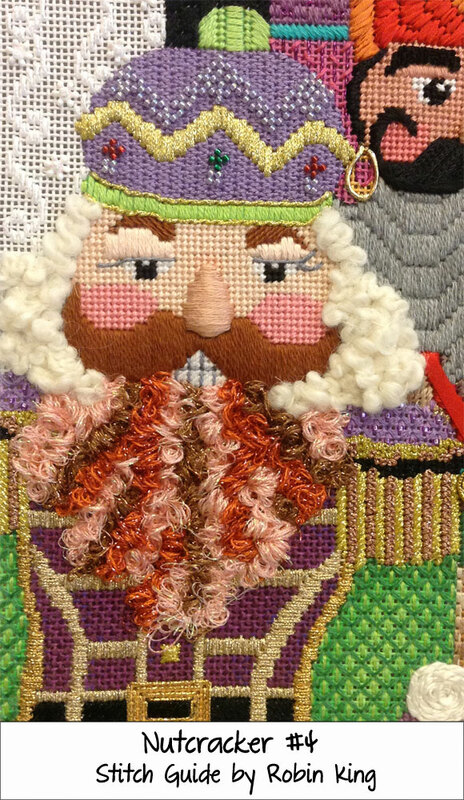 It was only later, well into the following months, that I saw how each Nutcracker installment was turning out. Or, more importantly how they looked with each other. May I just say I was very pleased. Wind the clock forward to now and you see the finished Jolly Nutcrackers. 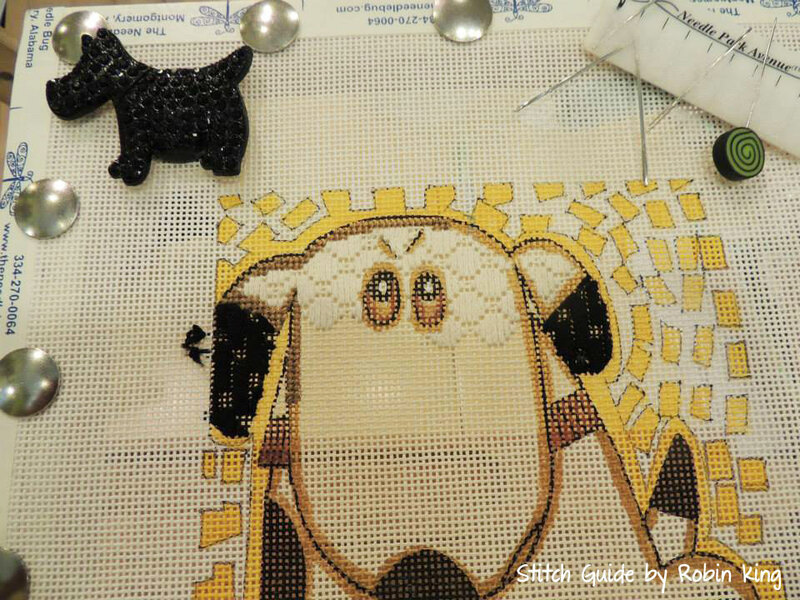 Diane (the main stitcher) and everyone at 3 Kittens Needle Arts did a wonderful job. I also wanted to let you hear from Julie as she too, was most integral in this project. 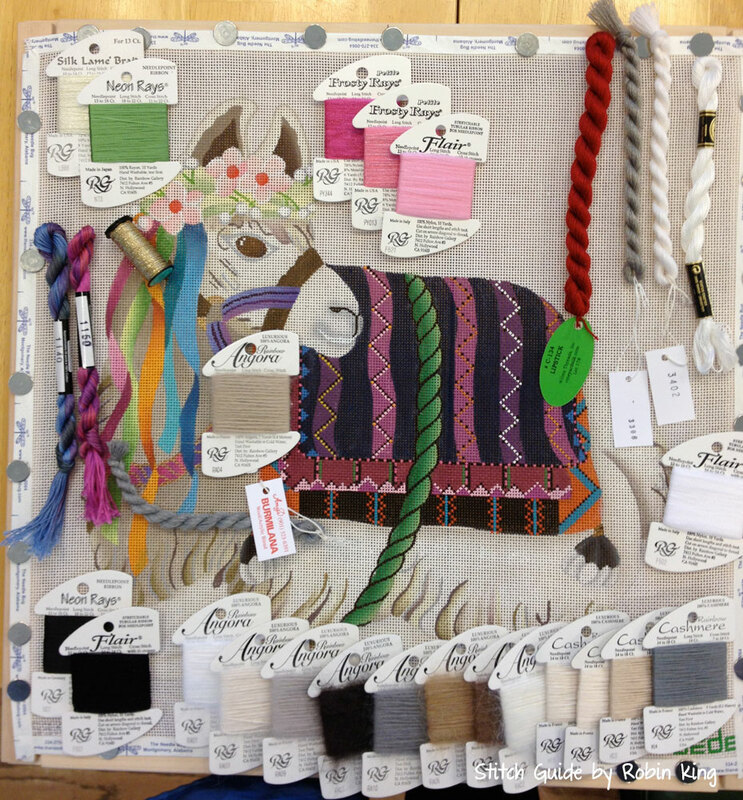 "We were first inspired by this canvas when we were hosting a Dede Ogden trunk show. 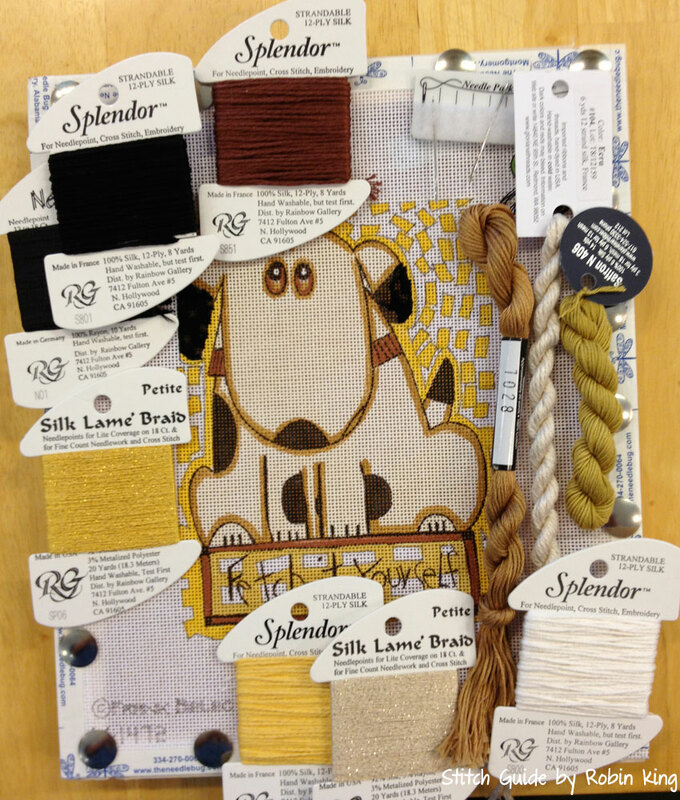 We pulled this canvas out of the box and showed it to a group of stitchers who happened to be in our shop at the time. 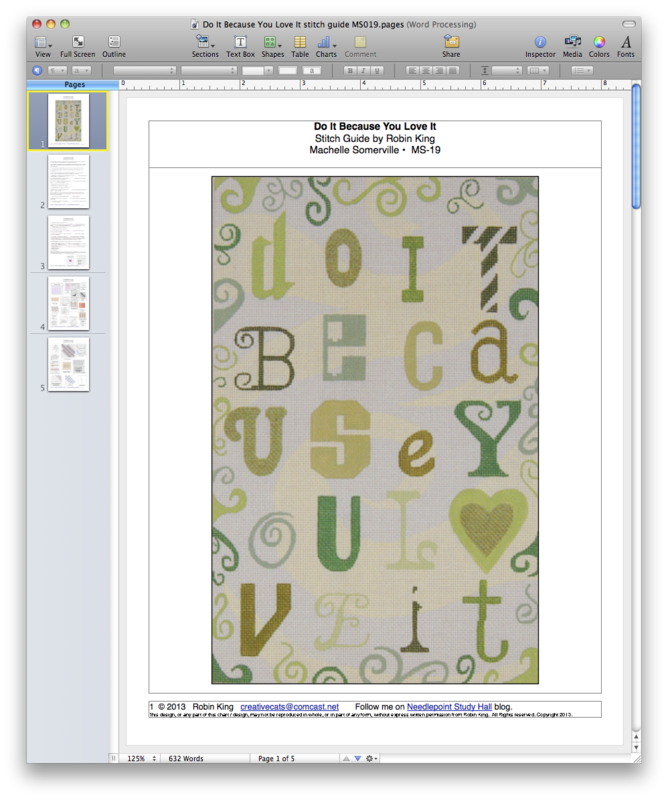 We said how about this for a class? 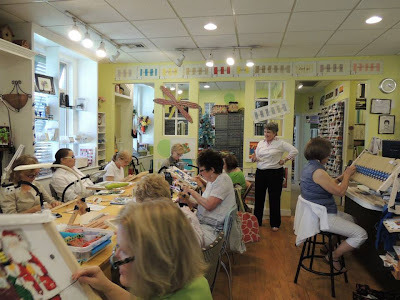 Everyone immediately said “let’s do it!” and a week later we had 18 people divided up into three separate stitching classes to take on this canvas as a monthly class. We contacted Robin to design the stitch guide for this amazing canvas. 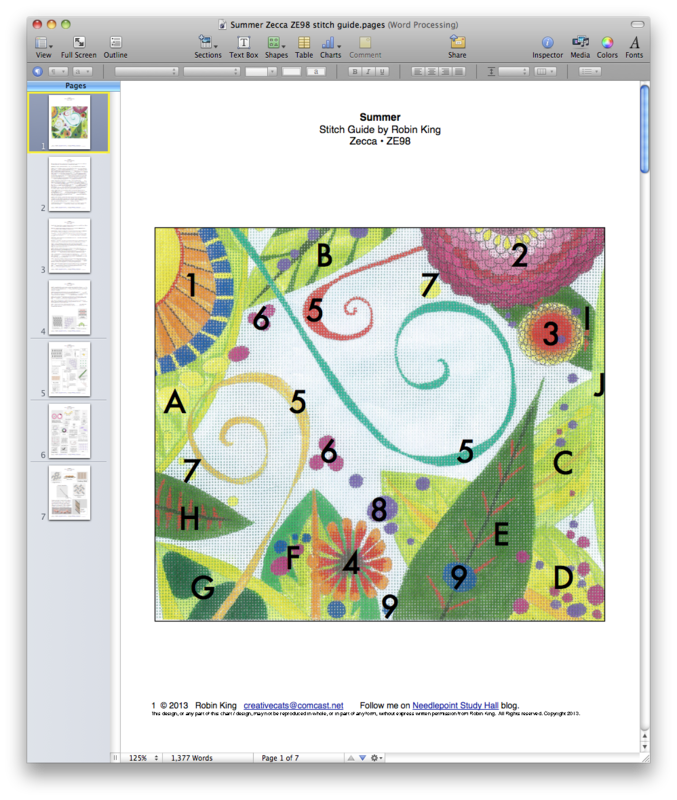 We sent her the painted canvas and she wrote us a guide once a month over a 9-month period of time, each month featuring one Nutcracker. 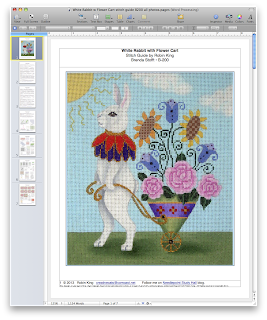 Little did we know that we had ventured into a “Mystery Class” format – we were able to stitch it monthly right before we taught the classes – sometimes just in time! It was impressive that Robin was able to deliver such a creative and inventive stitch guide without stitching the canvas. 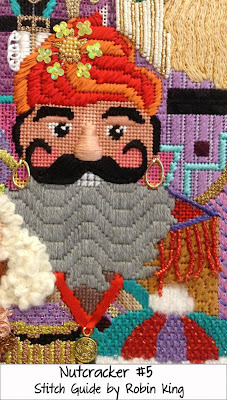 The final guide included all the Beards, Mustaches and Hair and the awesome background darning stitch! Nutcracker #1 (Red & Green) – we were so excited when we received our first stitch guide and knew were in for some fun! 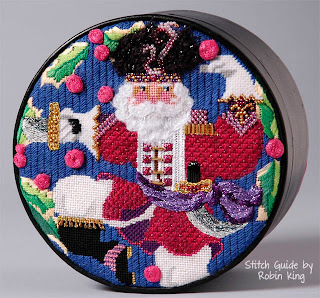 The ruching and the twisted Kreinik w/bead on the Epaulets, the gorgeous stitch on the Sleeves and the padded technique on the Nose – we were in for a wild ride! 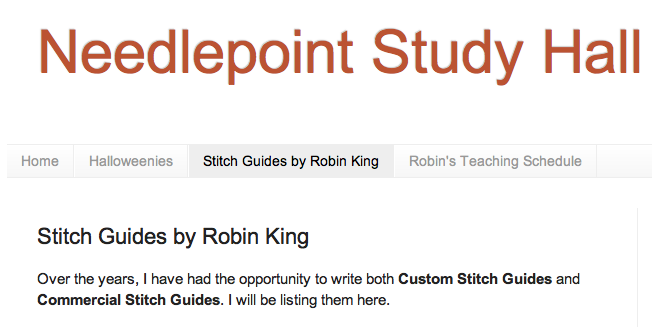 Robin was gracious and patient with us as we consulted with her over the phone and via email to get this right. 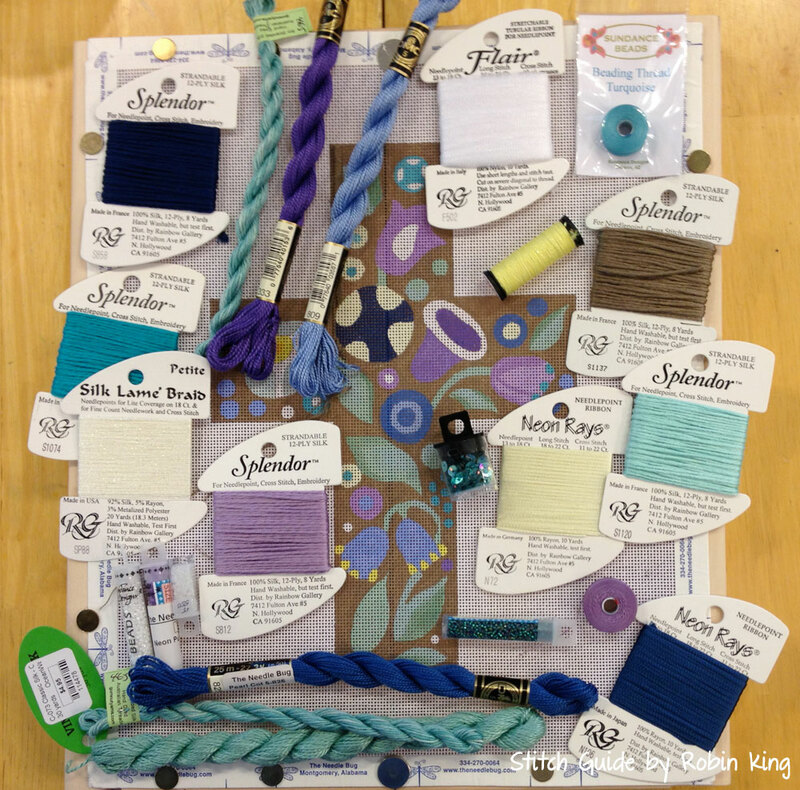 The first round of classes were thrilled with the beautiful thread choices, the sparkle and shine and loved the new challenges. Most were intermediate level stitchers and we happy to have these new stitches and canvas embellishment techniques to add to their repertoire. Step on the hat was right on and a challenge worth meeting by all. 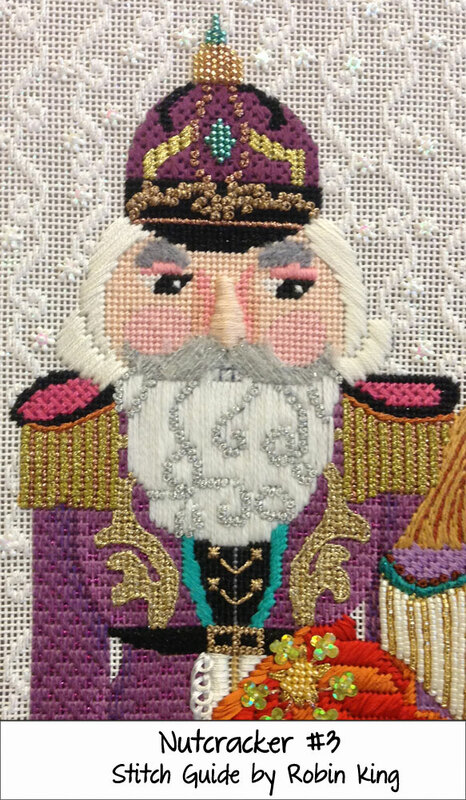 Nutcracker #3 (Purple) – very realistic “goldwork” on his Jacket. The Detached Buttonhole was a new technique that really captured the ruffle on the Shirt. 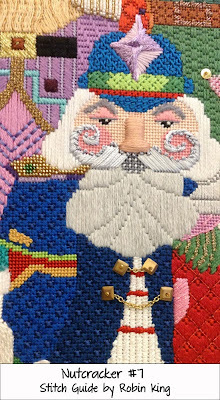 Nutcracker #4 (Green) – beading on the Hat and the green jacket – stitch allowed us to learn and teach a new anchoring technique. 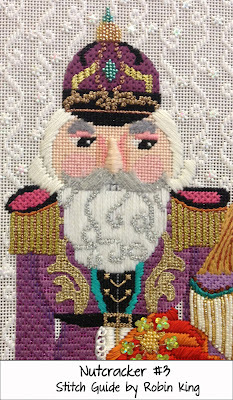 Nutcracker #6 - we enjoyed working the Double Stitch for his hat. 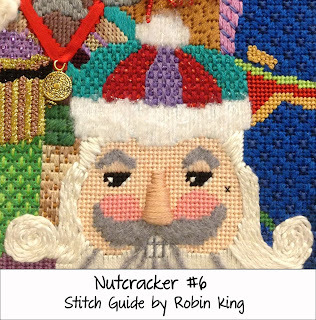 Nutcracker #7 – we collaborated with Robin on “tweaking” the Purple Jewel; once we tried her original idea and sent her a photo, we all realized we needed to come up with another stitch. 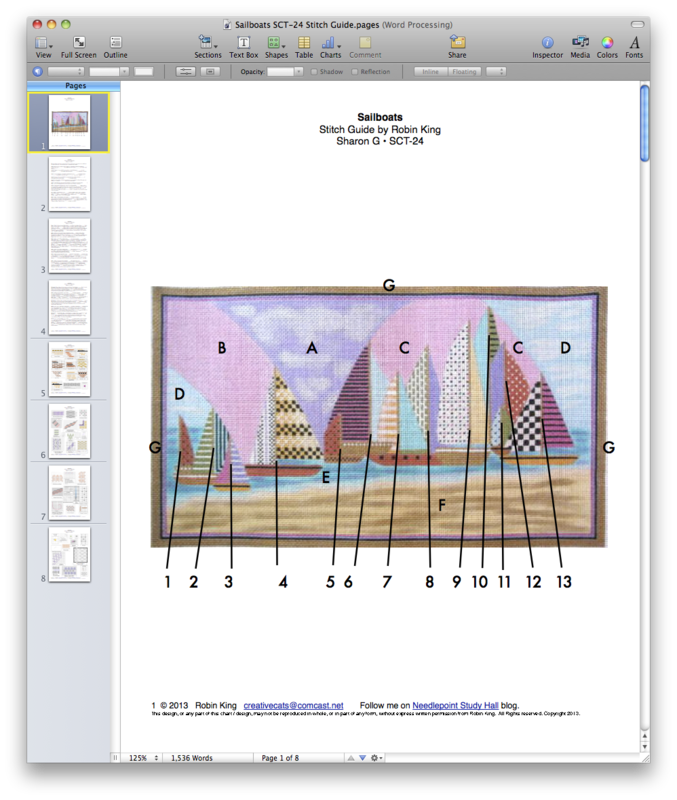 The final solution is fantastic – a Triangular Rhodes stitched in a mirror fashion. 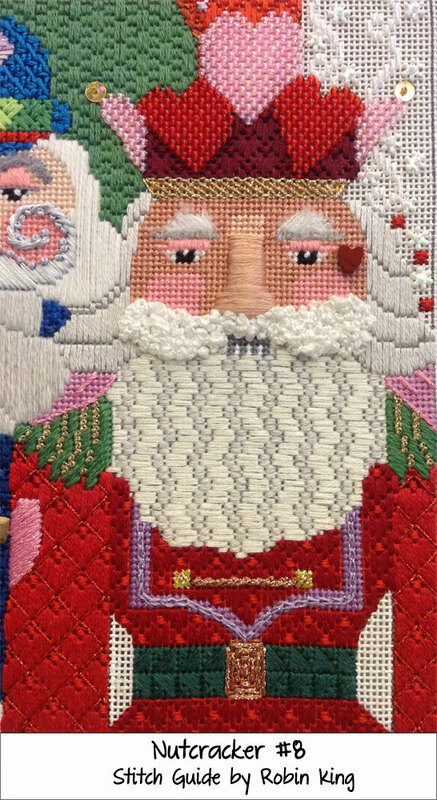 Nutcracker #8 – we all increased our beading skills throughout this canvas, culminating into the beaded Heart crown; the Jacket Heart stitch was the perfect companion! Beards, Hair, Mustaches – we now have a full complement of textures and techniques that can be applied to so many other designs – what an inspiration! 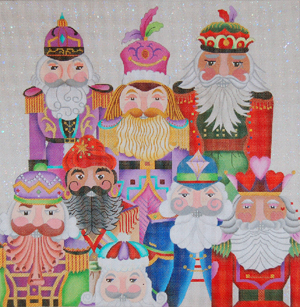 Each Nutcracker had its own personality and unique embellishments. Background – this was the first time many of us worked a darning stitch and incorporated sequins – this was the perfect stitch and embellishment combination that evokes a festive, fun, light and airy backdrop to the Jeweled Nutcrackers in the foreground. This entire canvas continues to be oohed and aahed over by all who see it! Many thanks to Diane who stitched the Jolly Nutcrackers. 3 Kittens Needle Arts is proud to have worked with Robin – a true creative genius and collaborator! We can’t imagine how the process could have gone any better. We hope we get the chance to work with Robin again – if this is an example of the results, we are anxious for our next project to start! Our customers could not have been happier – thank you for sharing your creativity. So now I can add more Nutcrackers to my needlepoint repertoire. Many thanks to Julie, Diane, and everyone at 3 Kittens Needle Arts for this creative opportunity. For any shop owners interested in their own Jolly Nutcrackers experience, please email me at creativecats@comcast.net. 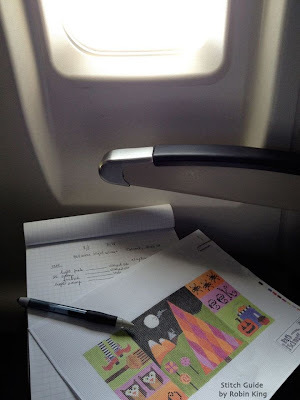 Sorry to be so long to blog. Everything is fine. 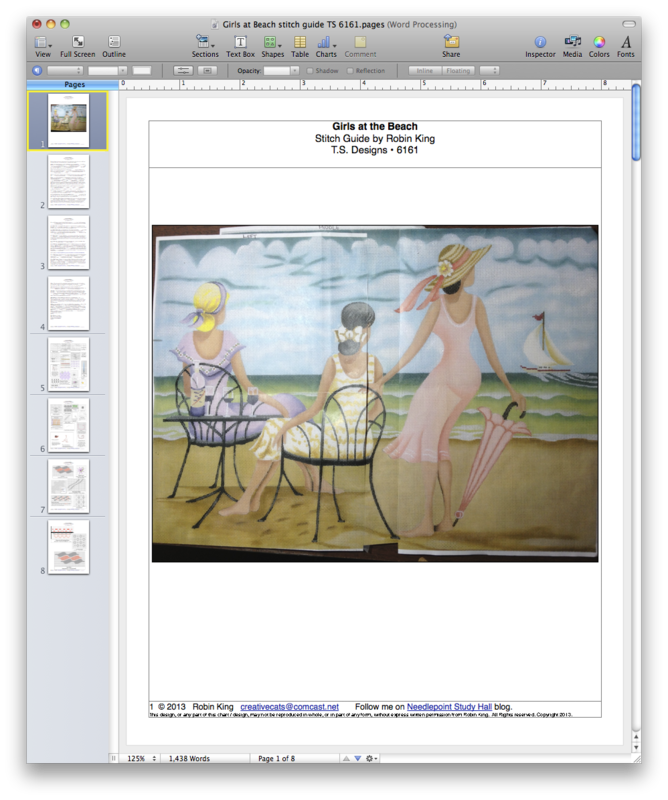 Just busy with deadlines. So let's see... where were we? I traveled to The Needle Bug (Montgomery, AL) and taught two lovely classes. The first class was The Thistle by Zecca (ZE 178). 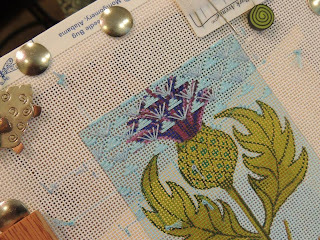 Everyone enjoyed my Neon Rays technique making The Thistle into a 3D delight. No need to compensate around this Thistle. What a dream canvas! 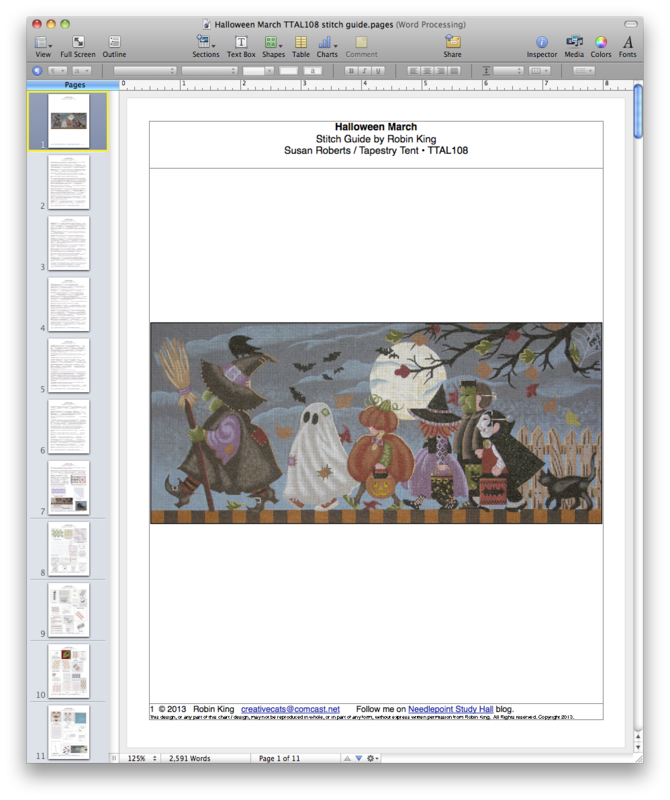 ... and did I mention it is only 3.5" x 5.5"? Sweet. 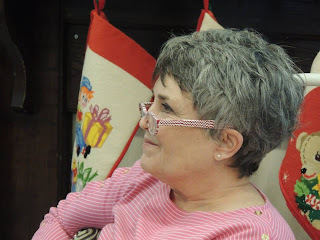 We had a special guest in class: Marie-Therese Baker (Director of the Callaway Gardens School of Needle Arts) who drove from her Kansas City home to take my class. Actually, she was at The Needle Bug the day before speaking to the local (and well attended!) 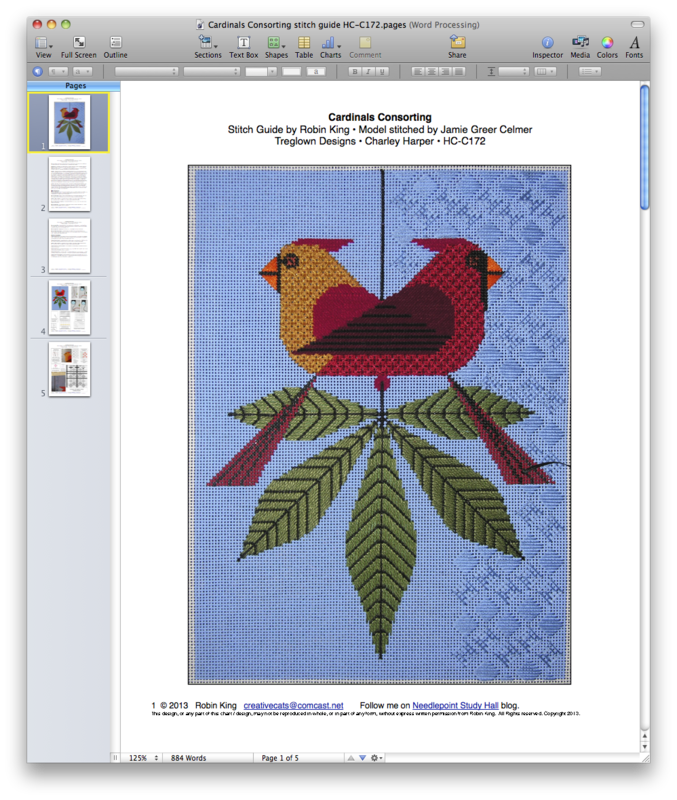 Montgomery, AL ANG group about the upcoming 2014 Callaway Gardens Needle Arts event. Marie-Therese in my class. What an honor. Callaway Gardens School of Needle Arts (located in Pine Mountain, GA) is about 1 hour 35 minutes from Montgomery, and it is about 1 hour 14 minutes from Atlanta. 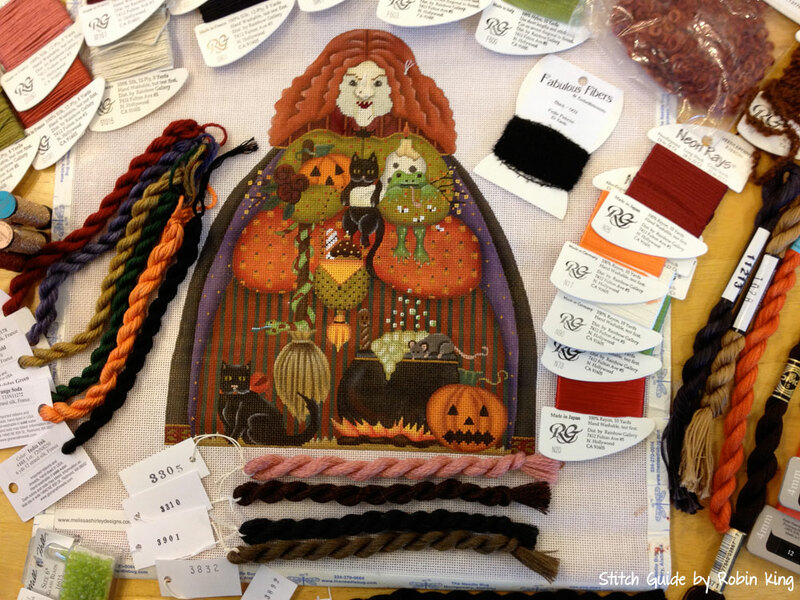 It is certainly the "Jewel of the South" for any needle arts lover. The upcoming 2014 event (Sunday, January 12, 2014 to Wednesday, January 22, 2014) will have such famed needlearts teachers as Meredith Willett, Marnie Ritter, Phillipa Turnbull, Terry Dryden, Lois Kershner, Carole H. Lake & Michael Boren, and Joan Thomasson, to name a few. 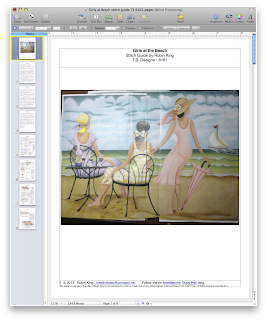 Believe me there are more teachers and classes... read about them on this Course Descriptions link. The Needle Bug brought and ran the "store" at Callaway in both 2013 and will return in 2014. Great feather in your cap, Leigh. After The Thistle class, Leigh scheduled a Tasting event for her customers and friends at The Vintage Olive. 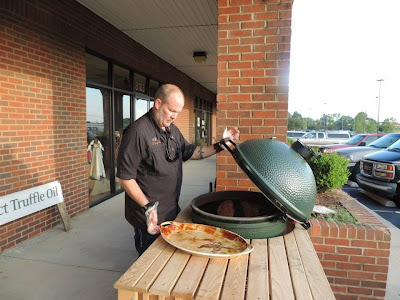 This is a lovely locally-owned store operated by husband-wife duo, Ed and Carly Gannon. They sell Gourmet Extra Virgin Olive Oils, Aged Balsamic Vinegars, Seasoning Packets, Sea Salts, Rubs, Pasta and Pesto. (Yes, you can order online, too.) A feast was prepared for our group; each dish featured their various Olive Oils, Balsamic Vinegars, and Seasonings. We had Appetizers, Salad, Vegetables, Cornish Hens, Shrimp, Salmon, and Dessert. 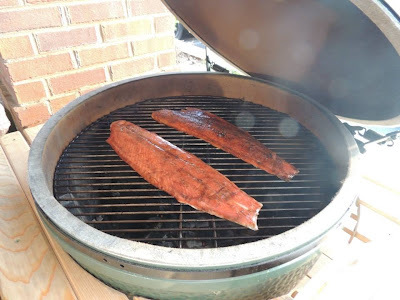 Ed cooked Salmon - two ways - on his Green Egg Grill. Leigh took these photos; testimony for how good the food was. Oh, yes... both Salmon dishes were THAT good. Grilled Salmon fillet with Red Apple Dark Balsamic & Arbequina Extra Virgin Olive Oil marinade with hand-blended Coffee BBQ Seasoning blend. 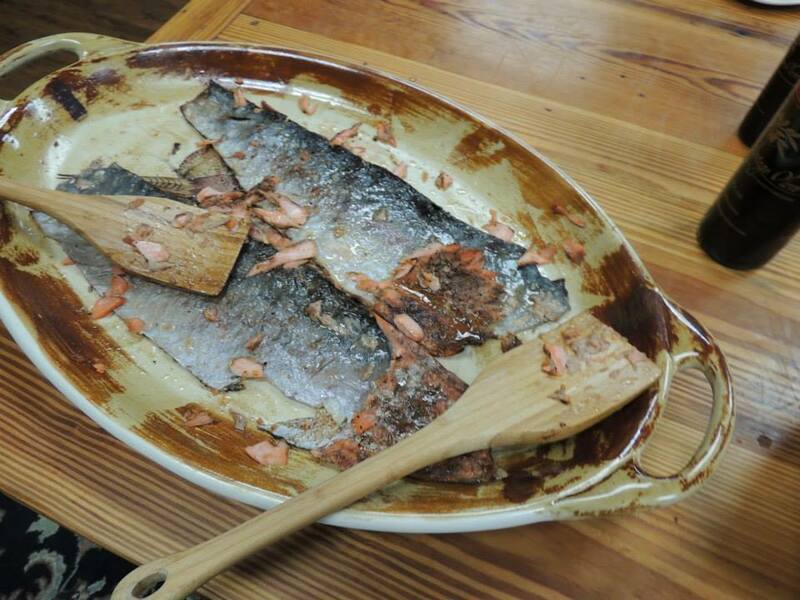 Grilled Salmon fillet with Maple Dark Balsamic, Roasted Walnut Oil marinade & Italian Herbal Sea Salt. The underlined words are the products from The Vintage Olive. I purchased an assortment of products and brought them home to Memphis. May I just say fresh Strawberries drizzled with Maple Balsamic Vinegar is brilliant. 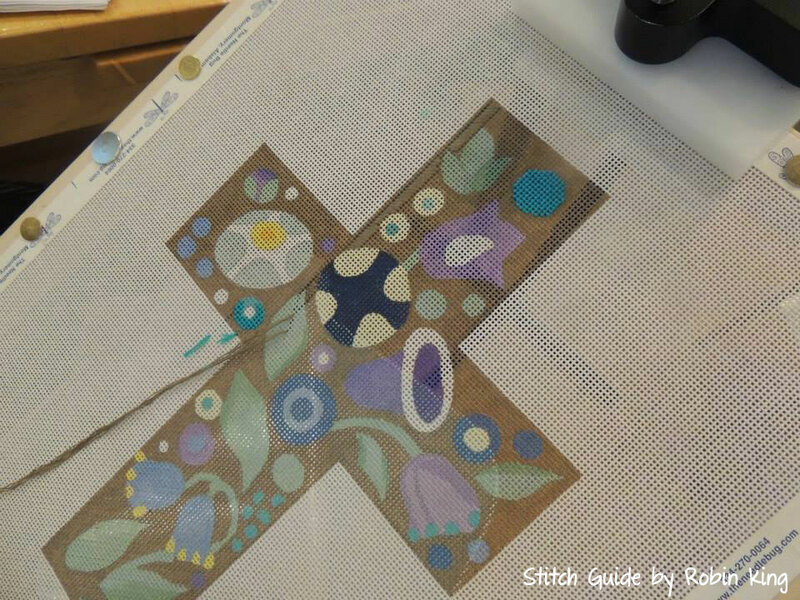 Laying down the first stitches on the Cross. This dog is coming to life. 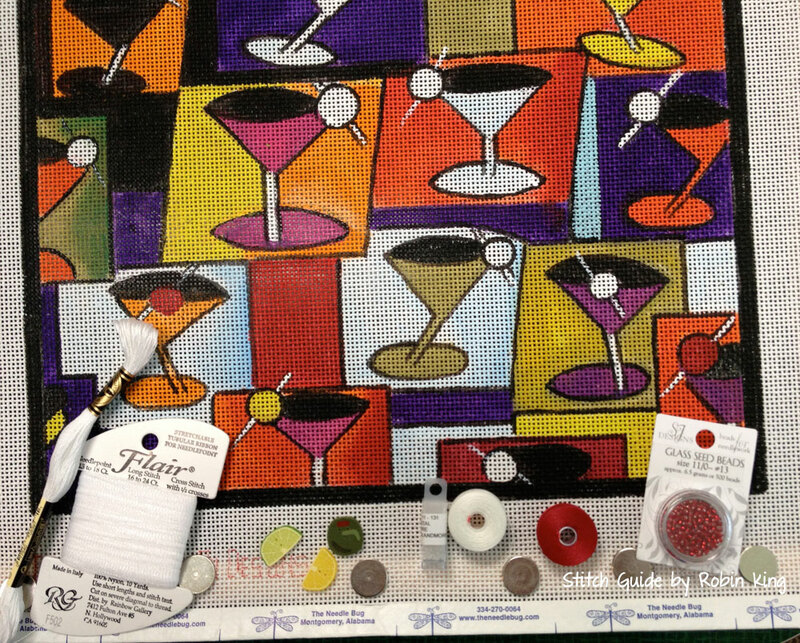 Stitching this canvas on 13mesh can be its own drinking game. Say "Cheers" after you finish stitching a Martini glass. 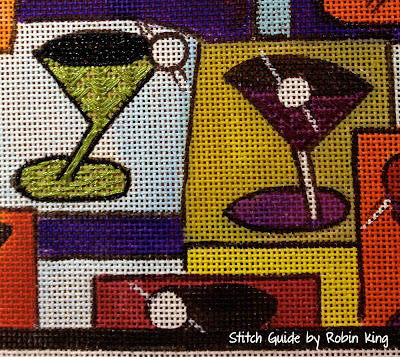 Raised Stem is a fun stitch to do. I had a great time at The Needle Bug. Always do. Looking forward to my next visit. On my way home I got back to work... writing stitch guides. 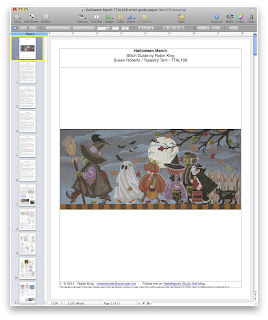 Halloween Night stitch guide available soon! My next deadlines will be here soon. 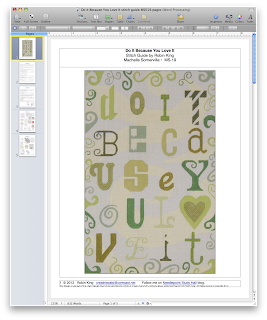 And, shameless plug, as you know... once the customer has their stitch guide, it is available for you, too. Either directly from me or through your LNS. Just email me with your inquiries: creativecats@comcast.net.